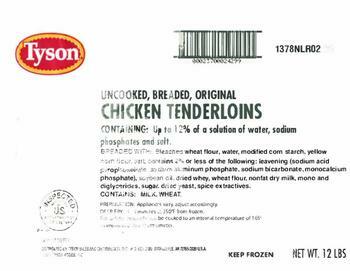 Tyson Foods of North Little Rock, Ark., is recalling approximately 3,120 pounds of frozen breaded chicken tenderloins. The product may be contaminated with extraneous materials -- specifically pieces of blue and clear soft plastic. The recalled product, bearing establishment number “P-746” on the product package, was shipped to food services establishments, nationwide, and was not available for purchase in retail stores. Institutions that purchased the recalled products should not serve them, but discard them. Consumers with questions about the recall may contact the Tyson Foods call center at (888) 747-7611.